William of Malmesbury (c.1090-1143) was a monk, historian, and librarian at Malmesbury Abbey. Geoffrey of Monmouth (c.1100-1154) was a chronicler who was elected bishop of St. Asaph just before he died. This manuscript belonged to the Cistercian abbey at Margam, in Glamorgan, Wales, which was founded by in 1147 by Robert, Earl of Gloucester, to whom both William and Geoffrey dedicated their works. 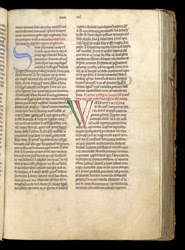 The initials on this page introduce the prologue and text of Book IV of William of Malmesbury's 'History of the Kings of England'. Book IV begins with the birth in Normandy of William Rufus, son of William the Conqueror.